Last night, after cooking dinner and still having the oven on, I decided we needed to bake something. Our friends at Krusteaz had sent us a great back-to-school package, including some of our favorites (including the Meyer Lemon Pound Cake which tastes just like the one you get at the coffee shop, but that was eaten immediately). We also had a box of the Pumpkin Spice Supreme Muffin Mix, so figured that would be great for a quick breakfast. Fifteen minutes later, the whole house smelled like pumpkin, and I decided to make breakfast for lunch boxes. In this lunch, we have two yummy pumpkin spice muffins, in proper fall printed muffin papers, because you can't have pumpkin muffins in non-fall printed papers. I had some grapes in fridge and just bought some tangerines, so each of my side containers got a fruit. For protein, I added a boiled egg and some yogurt in an EasyLunchboxes Mini Dipper, then packed the lunch in one of our EasyLunchboxes. The lunch looked a little simple, so I decided that it had to look back at me and added eyeball picks to all the foods. Such an easy addition made all the difference and the kids and I were cracking up at our lunches looking back at us. Great idea! 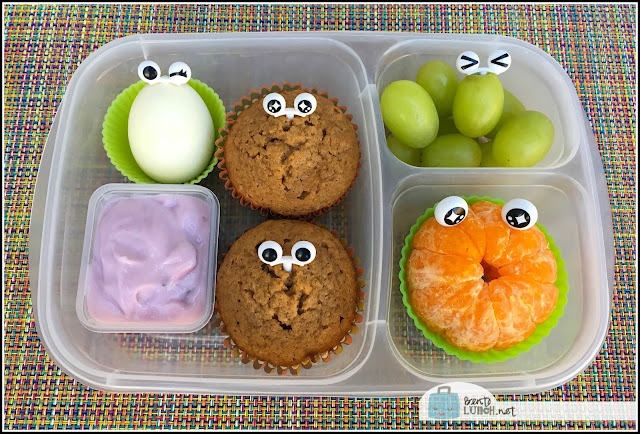 I'm always looking for new lunch ideas for my kiddos. I'm going to have to make this one soon!